Located in the heart of the buzzing financial and shopping district of Dubai, Conrad Dubai offers elegantly furnished accommodations with panoramic views, 3 unique dining and entertainment venues and a luxury Spa and Fitness Center. 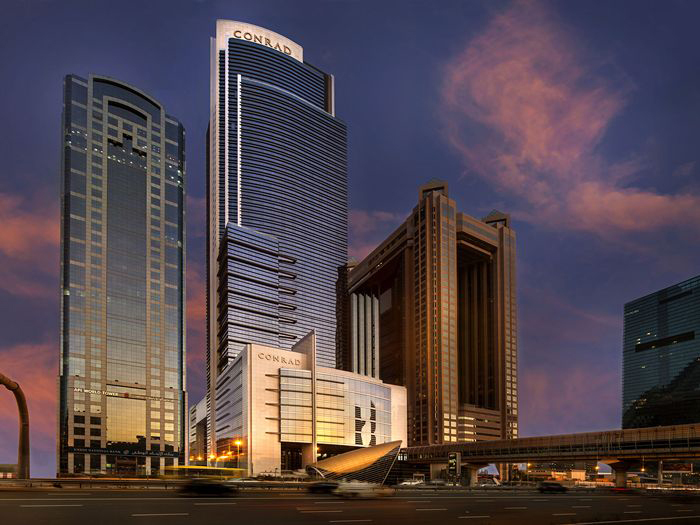 Dubai World Trade Centre is a 2-minute walk and Dubai International Airport is a 20-minute drive from Conrad Dubai. Free valet parking is available on site. Conrad Dubai represents one of the largest meeting spaces in the city with a total area of 4,400 square metres and offers a splendid setting for social gatherings of all descriptions. With 11 flexible and dynamic conference rooms, three boardrooms and two grand ballrooms, the Conrad Dubai provides the perfect backdrop for special occasions, business meetings, product launches and corporate gatherings. Discover a new standard of contemporary luxury and enjoy a prime location in the heart of Dubai’s financial and shopping district. With innovative facilities and impeccable service, the Conrad Dubai provides the perfect surroundings for a memorable event.